On a summer’s day, John Jasper has come to call on Rosa Bud much to her horror. “If he had chosen his time for finding her at a disadvantage, he could have done no better. Perhaps he has chosen it.” Rosa was utterly alone. Jasper wishes her to resume her music studies with him, but she is resolved to leave off that study. It’s not long after that Jasper confesses what Rosa has sensed all along. 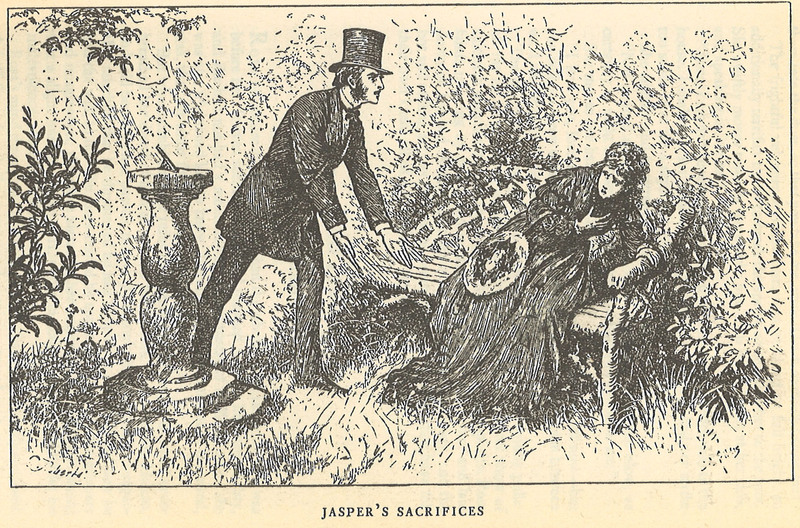 Further Jasper elucidates, “Judge for yourself whether any other admirer shall love you and live, whose live is in my hand.” There is a thinly veiled intimation that Jasper might have swept Drood from her side and my condemn Neville for the crime. She recognizes Jasper’s “self-absorption in his nephew when he was alive, and his unceasing pursuit of the inquiry how he came by his death, if he were dead, were themes so rife in the place, that no one appeared able to suspect the possibility of foul play at his hands.” She reasons out his likely guilt and the reasons for it all being to possess her. She hastens to London and to her guardian, Hiram Grewgious, who vows to protect her. She relates to him what had transpired between her and Jasper in the garden. Grewgious in turn alleviates her anxieties and sets her up with lodgings in London under his protection. On a side note: Grewgious makes mention of his clerk, Bazzard. “He is off duty here, altogether, just at present.” This allows for the possibility of Bazzard being employed by Grewgious as the mysterious Datchery. These two chapters would make it seem more than ever that Jasper is the killer of his nephew, but would Jasper’s villainy entail taking credit for someone else’s crimes to further his own ends? Stop by next week for Chapters Twenty-One and Twenty-Two.